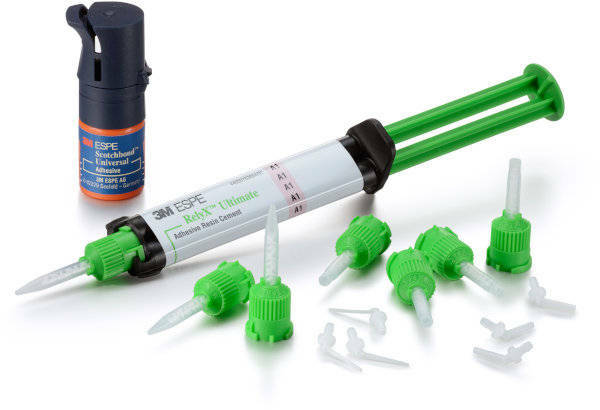 RelyX Ultimate adhesive resin cement combined with Scotchbond Universal Adhesive provides optimal versatility and simplicity for restorations with exceptional strength and esthetics. I have been a devoted user of RelyX cement for several years now and I had decided to give the RelyX Ultimate a try. Going into it, I was optimistic from the start due to my overall success with conventional RelyX. I did not, however, want my success with it to bias my decision in any way. Upon usage of the material, I noticed an enhanced workability of the product that I truly did not expect. The delivery of the material directly into the prosthesis with excellent viscosty and a working time to suit clinicians of all speeds all conspire to make this product an asset to any practice. I use this product combined with scotchbond universal adhesive on most of my fixed prosthodontic restorations. I currently place a large percentage of emax restorations milled from my own cerec 3 machine and using scotchbond and Rely X ultimate have simplified the amount of products that I need to keep in the office and the amount of steps required to bond these restorations. It can also be used in total-etch, selective-etch, or self etch applications. I highly recommend this product in combination with scotchbond to keep supplies down, simplify bonding steps, and have the ability to bond any restorative material. I like this cement. Clean up is easy If you don't over cure initially . I find that a one second cure, then the cleanup is fairly easy, 2 seconds and its too hard. then just 10 second on 3 sides Buccal, occlusal and Lingual, since its a dual cure I don't even worry about whether the light penetrates all the way. I have not had sensitivity or any cement failures in 2 years of use.